You might recall this post from last year where I compared New York and Toronto’s restaurant offerings and questioned why Toronto wasn’t known the world over as a must-visit destination for vegetarian foodies. While I still think this is one of the best cities for it’s wide variety and countless list of vegetarian and veg-friendly restaurants and bakeries (so many that while having lived here all my life, I still haven’t even been to all of them) I’m sorry to report that since writing that post, several of the places I singled out as being oh so special and unique have closed. We no longer have an Italian cafe to get vegan cheesey rice balls and there’s no longer a place I’m aware of where you can sit down and order a vegan fried egg sandwich. The final blow came this week when I heard the news that our beloved all vegan taco shop, Hot Beans, home of the mac ‘n cheese burrito I raved about, is closing at the end of February. Hearing the news that one of my all time favourite restaurants was shutting down, I initially screamed with horror and vowed to be grumpy for the rest of my life. However, after taking some deep breaths and listening to this week’s Toronto Vegetarian Podcast, I was reminded that there is more to being vegetarian than just eating out at restaurants. In fact, Toronto remains a spectacular place to live if you’ve decided to forego eating animals because of several other unique destinations, events and groups we have here. 1. Veggie Toastmasters: How cool is this? If you’re not familiar with Toastmasters in general, it’s a club with chapters all around the world where people get together to improve their public speaking skills. Now, there’s a budding chapter in Toronto specifically for people to chat about all things vegetarian! Click here to listen to a recent podcast interviewing the leaders of this special Toronto chapter to learn more. 2. A vegetarian library and bookstore: I’m not just trying to plug one of TVA’s programs here. Really, where else can you find a vegetarian library? How amazing is it that whenever you’re itching to try some new recipes you can come and sign out a vegetarian cookbook, for free, for a month!? The Resource Centre’s selection is huge, including both decades old classics as well as the latest cookbooks from the most popular chefs and authors. If you’re looking for a gift for a vegetarian, the bookstore is also an awesome one-stop shop to find whatever book may be on their wishlist. 3. Vegan hair salons: Toronto has three all vegan hair salons that we know of and two of them even give discounts to TVA members! Check out Vegan Vanity, Tranzitions and Kind Hair Shop. 4. Veggielicious: Although this is another TVA event, we Toronto vegetarians really must thank Lisa Blonder-Ohlenkamp for bringing this fantastic event to our city. She was the mastermind who dreamed up the event and led it for several years. It’s grown to be a two-week long celebration for vegetarians and omnivores to explore Toronto’s diverse selection of vegetarian offerings. There’s a lot of events that happens in cities around the world that plant-based eaters often feel left out of because we’re not sure what vegetarian options there will be. But here in Toronto we have an event all to ourselves that we can truly look forward to each year! 5. 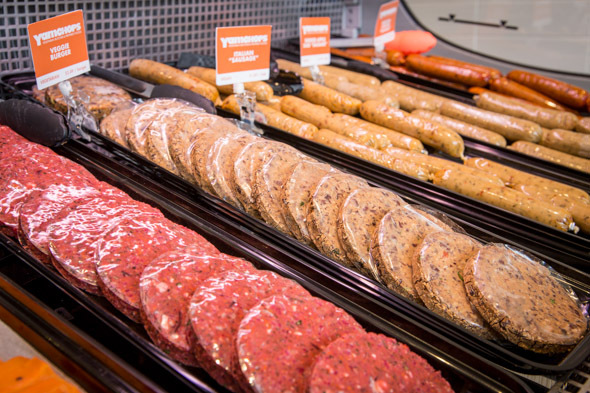 A vegetarian butcher shop: There may be a few of them opening up now around Canada and the US, but Toronto can proudly declare we were the first North American city to have our very own all-vegetarian butcher shop. YamChops, in Little Italy, has taken Toronto by storm with their specialty items like “chicken schwarma”, “carrot lox” and so much more. I look forward to seeing what vegetarian surprise Toronto brings next. Posted January 22, 2015 by Barbi Lazarus. Filed under News, News from the Toronto Vegetarian Association, Toronto Veg Blog.